Our Au Gres-Sims Marathon Kids Running Club team was featured in an article on the ⁦Marathon Kids⁩ website. Congratulations to our student-athletes, coach Kelly Gough⁩, and all of our community volunteers. Great leadership Wolverines! 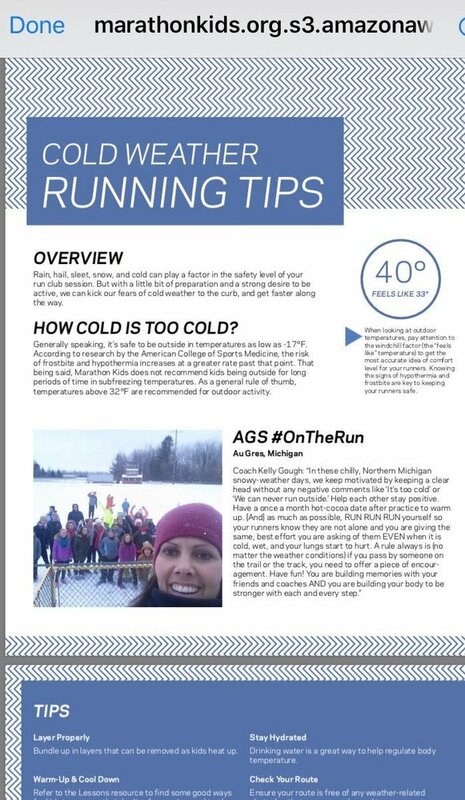 Coach Kelly Gough: "In these chilly, Northern Michigan snowy-weather days, we keep motivated by keeping a clear head without any negative comments like 'It's too cold' or 'We can never run outside.' Help each other stay positive. Have a once a month hot-cocoa date after practice to warm up. [And] as much as possible, RUN RUN RUN yourself so your runners know they are not alone and you are giving the same, best effort you are asking of them EVEN when it is cold, wet, and your lungs start to hurt. A rule always is (no matter the weather conditions) if you pass by someone on the trail or the track, you need to offer a piece of encouragement. Have fun! You are building memories with your friends and coaches AND you are building your body to be stronger with each and every step." Through running, we show kids they can achieve more than they ever thought possible and put them on the path to healthier lives. Our Marathon Kids work at their own pace to run, or walk, four marathons, and we provide the training, rewards, tools and resources to keep them moving. We believe every kid deserves to live a happy, healthy life and that any adult can be empowered and trained to become an inspiring coach. They learn how to fuel their bodies so they can run faster, better, longer. And for a little extra motivation, they earn fun Nike rewards at milestones along the way. They have a network of dedicated adults showing them how it’s done, and most importantly, a motivated and inspiring Coach supporting them every step of the way.